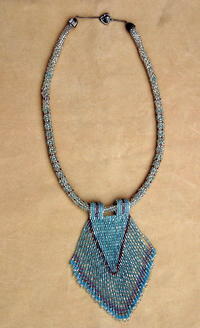 Worked in shades of silver, aqua and light amethyst, this beadwoven pendant glitters and glows by turns. I've added a fringe of small silvery glass bugles, aqua seed beads, Swarovski light amethyst and aqua crystals. The longest fringe element ends about 4-1/4" below the strand. The same seed beads are used in a variety of stitches to make the 20-1/2" strand. The clasp is a pewter heart-shaped toggle. Intricate and lovely, it's no more than you'd expect from SPARKLE PLENTY. All our one of a kind and limited edition artisan beaded jewelry is individually handcrafted in our studio in Los Angeles, California. Be sure to check out our other indie boutique jewelry styles and fashion accessories. Give a unique and unusual gift. The light sapphire crystal arrow-shaped pendants are from Swarovski Crystal, and measure about 1inch long by 5/8 inch at their widest. This lovely sterling silver pendant features ovals of rainbow moonstone and of jet black glass with a Balinese dancer picked out in gold.